From NC Field and Family. Horace Pritchard knew nothing about wind farming, other than what he’d seen on television, until one day he got a call from a company asking if he’d be interested in leasing some of his land for a few turbines. “I thought they were doing energy for houses. I didn’t pay any attention to it,” says Pritchard, a 50-year veteran farmer who grows corn, soybeans and wheat on 1,300 acres in Perquimans and Pasquotank counties. 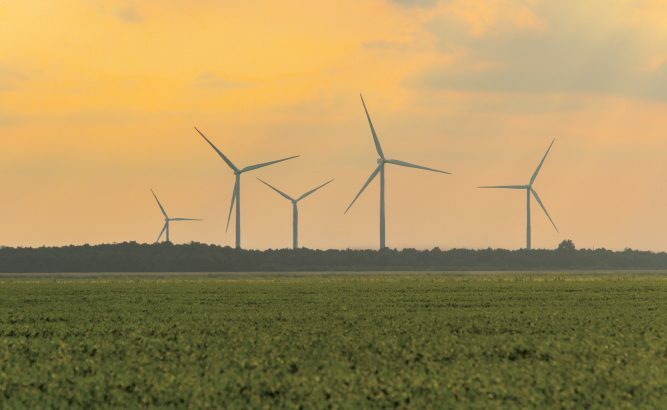 In early 2017, the Amazon Wind Farm U.S. East began operating 104 turbines powered by Avangrid on about 200 acres (scattered over 22,000 acres) in the two counties. The first commercial-scale wind farm in North Carolina and one of the first in the Southeast, it delivers energy into a mid-Atlantic grid that supplies energy to Amazon Web Services cloud data centers. Much like water at a hydropower plant, the wind turns the blades of the turbines to generate electricity. The availability of this reliable, clean natural resource, along with access to a high-voltage transmission line, made the flat land in the two narrow “finger” counties the perfect spot for a wind farm.